Today I had a very interesting incident with my almost 5 year old daughter. I had sent her to go brush her teeth in my bathroom and she was in there for a few minutes and I heard her say “What is that smell in here?” I thought maybe someone forgot to flush or something. When I went into the bathroom I caught my daughter sitting on the sink with a funny look on her face and then I was hit with the strong smell of tea tree oil. Apparently she had opened the top to the small bottle I had on my shelf and spilled some. I asked her if she had opened the bottle and she immediately said “NO” with wide eyes. I of course KNEW she was lying to me, so I asked her again and told her to please tell me the truth. I really thought that she would say yes and admit to it and then I would give her a quick reprimand about touching my things and then move on to putting everyone to bed. Well, that was not the case. She just kept saying “no” each time I asked her. I then told her that she was going to be punished for lying to me and that she would not be able to have dessert after dinner tomorrow. Dessert lately (since Halloween) has been 1 small piece of candy. The kids look forward to this very much. But she still did not budge. I had to put my other kids to bed and I really felt like just letting it go and having her go to bed – after all I had punished her so should be ok to let it go. But I felt very strongly about following through with the situation, so I told her to stay in the bathroom and wait for me while I put her brothers to bed. She was crying when I went back into the bathroom. I sat on the floor in front of her and asked her again “Are you lying to me? Did you open my little bottle?” She just stared at me and didn’t answer. Then all of a sudden she blurted out that her little brother had done it. I was pretty shocked because I already knew she was lying and now she lied AGAIN. Isn’t it crazy how lying can actually cause blame and MORE lying? This happens with adults too! Gotta love the sin nature we have right? Well, I went through the whole shpeal about how I knew she was lying and how it is very important to tell the truth to mommy. I told her that there are consequences for lying. I told her that if she just tells the truth that she would not be in as much trouble, etc, etc. Then she quietly said “I’m scared”. I suppose she thought she would get in a huge amount of trouble for spilling the bottle and thought lying would help her to NOT get in trouble. I did more explaining and continued to ask her if she had opened the bottle. I wanted to stay consistent and not give up and just put her to bed without her admitting that she was lying. I thought that it was very important for her to come out and tell the truth to me. I spoke to her as lovingly as I could throughout our conversation. I asked her one final time and she FINALLY shook her head yes that she had opened the bottle. Tears welled up in her big brown eyes. I told her that I was proud of her for telling the truth and I told her to come into my open arms for a hug. She melted on me and cried. I teared up as well and and asked her “what do you say to mama for lying?” And she sheepishly said “I’m sorry”. And I hugged her tight and told her that I forgave her and told her how much I loved her and reiterated the importance of always telling the truth. I could’ve let the situation go and just punished her. 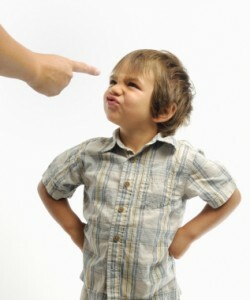 I often do that with little things that happen such as fights between the kids or bad attitudes. I reprimand and punish and move on. But there is just something about lying that I think is soooo important to really be consistent in following through and helping a child to admit they are wrong. I did this with my oldest son a few years ago. He is now 6 and he has not openly lied to me since then. When I ask him to tell me the truth, he usually does the first time around. He learned that lesson through me taking the time to sit down with him during the first major lying episode, and doing the same with my daughter will hopefully prove to be a valuable lesson for her as well. I know some kids take more time to get things just because of their personalities, but the whole point is to be consistent with discipline and take the time out to talk to your child right away when things like this happen because it really pays off in the end. How about you? Have you dealt with lying with your child? What did you do? Good for you! These are the kind of lessons that need to be learned very early in life. Otherwise it just gets tougher as they get older. What an absolutely GREAT Post Dawn. If you feel like sharing it, would love to run it in the community section of our site. I think there’s alot to be gained by learning from each other…and you do a wonderful job of teaching us by example. Thanks…and have a WONDERFUL holiday!! Thanks Stefanie. You are definitely welcome to share my post! Anytime! Thanks Christina for commenting. I totally agree about starting early in life. Dawn I just wanted to add my 2 cents in here. I was an early childhood educator and am a mother of 6. I made many mistakes with my oldest (who is not a Mom and doing a much better job than I did) but I think it is extremely important not to push kids up against a wall or get into a power struggle. Children that usually lie at that age do so for a few reasons. Kids worlds are so much different than ours and I think we need to be disciplining with less punishments and more love and understanding. Reading books like Robert Mackenzies Setting Limits or the famous book 1,2,3 magic dont hurt either but I really dont think we need to run to punish a young child who is lying over something so quickly. You could have have just said “Oh I see you opened that by mistake…let’s close it” and the discussion would have been fiinished. I approached my 6 year old son’s lying with the “it was probably a mistake” approach, but he took advantage of that naive approach. I think that giving a child the benefit of the doubt most often is the best way because otherwise they will feel like you are always condemning them, but when a child is clearly lying to you and you accept their story and say “oh it’s fine” and brush it under the rug with no council or reprimand then you are teaching your child to make excuses, lie about their actions, and not take responsibility for what they do or say. Excuse me for adding my 2 cents worth too. I would like to agree with Faige. When I was growing up, I lied terribly and looking back I realised that it was the way I was approached when I had done something wrong. In many cases, I was not aware that I had done wrong or it was an accident, but my parents’ approach and their body language told me that I was in trouble. I would be asked if I had done a particulare thing and although I was small, I could tell by the tone and expression that I had oopsed, so I lied. Once the lie had begun, I had to keep it up because if I kept lying, they couldn’t prove it. (if that makes any sense). When you know that your child has done something wrong, don’t ask them if they did it – You know he (will use just ‘him’ to make typing easier) did so why ask? Children are very aware of tone/inflection/facial expressions/body language. They know immediately when you are not happy with them. By asking if he did it, you are actually prompting him to lie or to blame someone else. I can smell that you opened mommy’s little bottle. Did you close it again? This way your child doesn’t have to defend himself. You can then tell him that it is your bottle and he shouldn’t open bottles if he doesn’t know what is in them because they could be dangerous. You can also tell him that he should ask before using something that belongs to someone else. You can then check with him that he has closed it properly and ask him whose bottle it is, reinforcing that it belongs to you. You have prevented him from having to lie to you and have also taught him about dangerous things in bottles and respect for other’s property. Thanks so much for your input Deni. I like really this approach. I am going to try this the next time one of my little ones lies. Thanks for taking the time to share!